Orthodontics is a specialised branch of dentistry that manages the diagnosis, prevention and treatment of teeth and jaw alignment issues. An Orthodontist is a specialist who have completed an additional 3 years full time Masters degree after their 5 years of dental training. 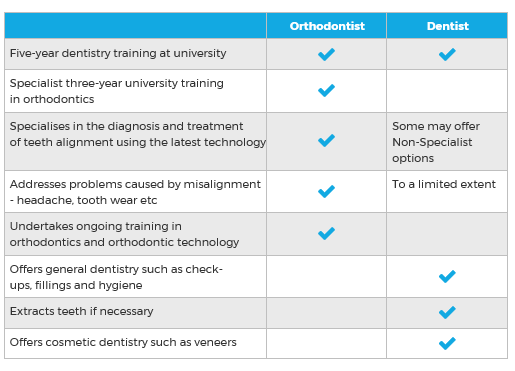 A general dentist receives broad training across all fields of dentistry and is typically the first to recognise that a patient may need orthodontic assistance. Working together, orthodontists and dentists can help you achieve the best possible results for your general dental health and your smile.